from left to right: Steve Loring, tenor, Niall Trimby, lead, Art Lively, bass, and Harvey Beetle, baritone. Missing from photo are John Richardson and his son Todd. 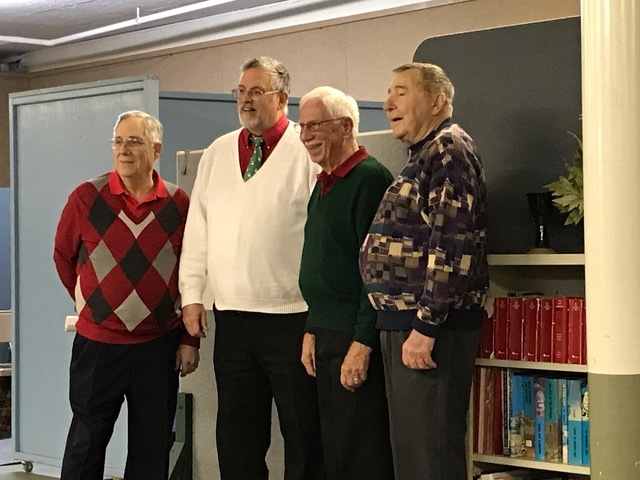 Members of the quartet “Kytch ‘N Sync” entertained at the annual holiday open house. The members of the barbershop a cappella ensemble is made up of six barbershop singers and is a member of the Lakes Region chords men chorus of Laconia and the Barbershop Harmony Society. Members of the local chapter of quartets sing throughout the area at nursing homes, senior citizen centers and assisted living centers. February is a favorite time of the year when the members deliver singing valentines to residents at their frequent visits to the local establishments. The local Laconia chapter also hosts the Alton Bay Barbershop Jamboree each year in August and assists with the Lakes Region Youth-In-Harmony Festival each spring for area high school students. The chorus has competed at the Society’s Division and District level and was recently recognized by the Northeastern District for its community outreach. The performance was the highlight of the well attended event.